the tinydance project is a performance ensemble based in the Northampton, MA area that began with the question of what dance and performance art would look like without the high-tech resources currently available to us. Kelly Silliman towing the original tinydance stage on her maiden voyage, photo by Dan Rist. 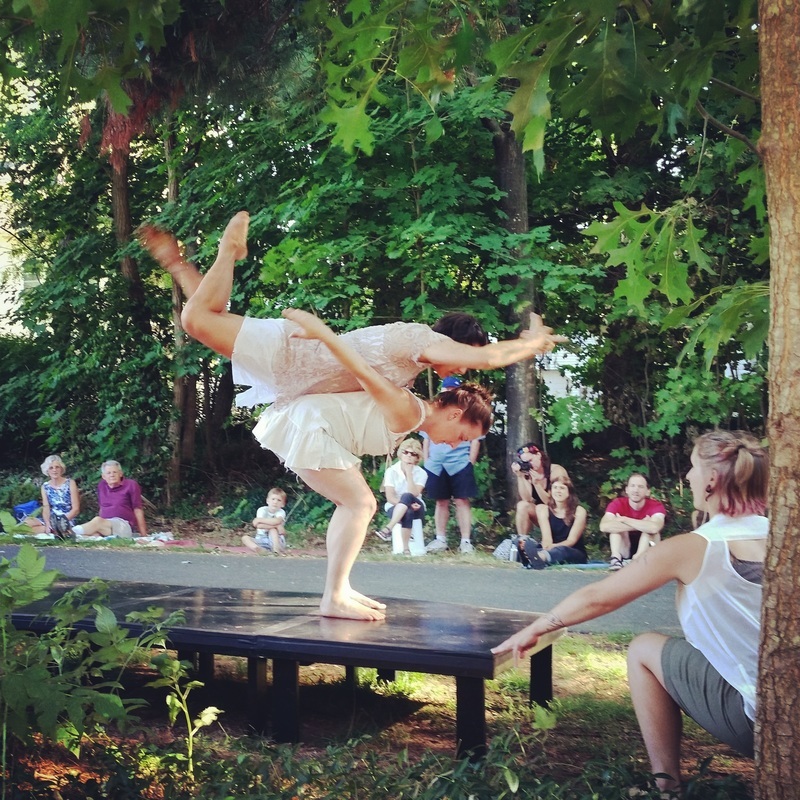 ​Tinydance performances are presented outdoors in public spaces and collaborators sing their own accompaniment, all on a 4’ by 8’ stage towed by bicycle to venues. Modeled after the values of Tiny Houses, which are highly designed for efficiency and beauty, the tinydance project presents multidisciplinary, movement-based performances with intricately woven and curated sound scores. Presenting work in this way is part of the company members’ practice and exploration of sustainability in art and life. Tinydance collaborators are always paid for their creative work, and maintain a commitment to presenting performances free to the public. ​The tinydance project began in 2012, and evolved during founder Kelly Silliman's graduate work at Smith College. Initially conceived as a project, not a company, early collaborators such as Michelle Marroquin, Maureen Shea, Crystal Nilsson, Cory-Ellen Gatrall, Liv Fauver, and Charnice Charmant helped set the (tiny) stage for art and community engagement that brought tinydance to its current company model. In 2014, collaborators Marie Brown, Nicole Kutcher, and Jayme Winell joined the project and became an integral part of honing the group's process and performance experience. Over the years, tinydance has performed and taught throughout Western Mass and beyond, including performances and residencies in Connecticut, Vermont, and New York. Please visit the performances page for more information. As part of its deep commitment to integrated community building, the tinydance project spent the summer of 2017 raising funds for the Prison Birth Project, and collecting bicycle repair tools for the Holyoke Urban Bike School (HUBS). This happened in partnership with tinydance collaborators’ other endeavors, including Renew Pilates Studio and Flame’n’Peach and the Liberated Waffles. ​After three seasons of active growth as makers, performers, and educators, and the filming and release of a documentary about company members' work and lives, tinydance took a rest year in 2018. In 2019, Kelly Silliman, Nicole Kutcher, and Jayme Winell will present new work during the 2019 tiny tour, the final tour for this particular project. Although we anticipate continuing our explorations of performance and sustainability, and expect to work together in some way again in the future, we are opening ourselves up to the unknown of what's next for each of us artistically, and are excited about the possibilities!